So what if you could combine two aspects of a storage problem. Like taking your surfboard and putting it somewhere that is dead space …like a wall in your apartment. 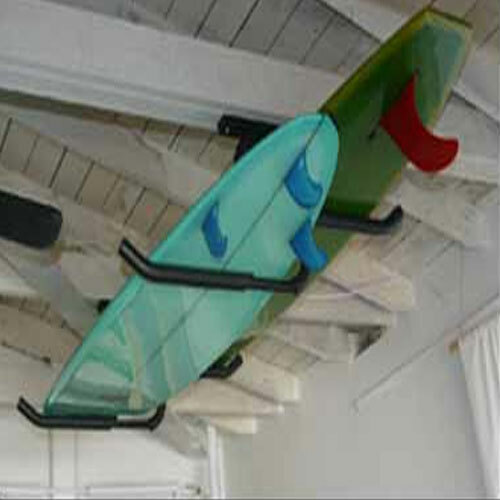 What if you could find a storage solution that not only stored your surfboard but allowed you to hang your surfboard in a way that made it look more like artwork than just a play toy. Hawaiian Gun Rack® a local small business that hand crafts surfboard racks has designed several stylish options for all kinds of surfboards and paddle boards that are extremely affordable and versatile. First … how much does your paddle board weigh? 2. …then pick up the board and weigh yourself and the board. 3. Subtract the weights and the difference is a close approximation of the board’s weight. Paddle boards are not little short boards that you can just put anywhere. You will have to take into consideration its bulk, weight and the thickness of the rails (its sides) before you just throw it up on the wall. Also make sure you know the dimensions of the paddle board rack that you intend to use, as some of the storage systems can’t hold thickness over 5 inches. This is crucial as the thickness of the newer touring and racing boards are typically at least 6 inches. This will save you time and headaches from “returns” that don’t fit. Also make sure you understand how the board will fit in the rack as some of the paddle board racks systems are designed for minimal space and require the SUP to orient in a specific way. Which is cool if you have limited area for storage …or you want something more for display. …Indoors or outdoors? …in the garage, by the boat house or in the living room – yeah …in the living room. You will be able to find most of the better made storage systems at www.hawaiiangunrack.com. 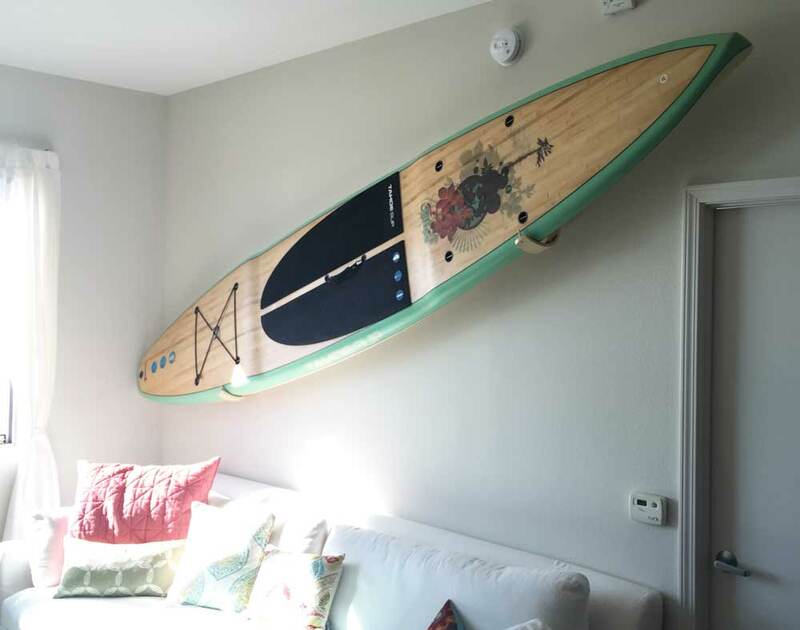 A California company that designs and manufactures several types of wall racks that take your storage problem and turn them into art …or at the very least help integrate the paddle board into your living space with a very nice flare. An excellent company that not only designs and manufactures their own brand but also carries other American made brands and they test the racks that they carry to make sure they do what they claim. 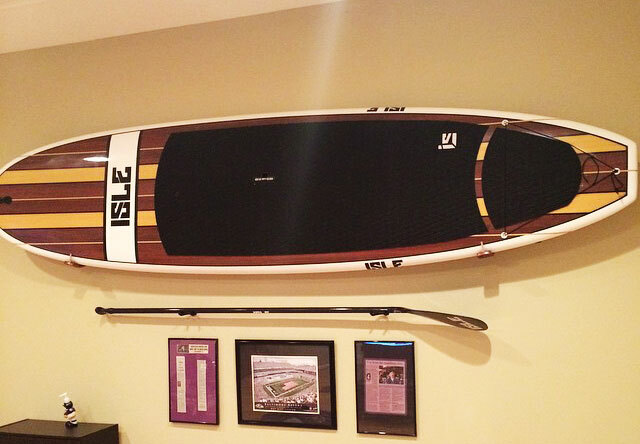 The Olo Big Board paddle board rack, rated to hold up to 40 lbs., can store your paddle board either deck out or fin out and only extends from the wall about 12 ½ inches. Made of wood (two colors to choose from) and it does a really nice job of showing only the board. It almost looks as if it’s suspended on the wall. You can pair it with a Hawaiian Gun Rack designed paddle rack of the same wood color. Now for Heavy duty outside or near the elements storage they carry the gatekeeper metal racks that come in several styles depending on how much space you have to play with and the number of boards you may want to store. Families usually have a couple of boards now that everyone realizes how much fun it is to paddle out on a sunny day. These are powder coated and will hold up to the elements if you have a boat house and want to store the board outside. If you want more in depth information on how to store your paddle boards, check back here as we are working on a DIY primer about the different types of walls and the kinds of hardware and their pros and cons. What type of wall is it? When designing art that is going to be hanging on your walls whether it’s surfboards or pictures of surfers you need to understand the foundation of what you will be installing into to create a safe environment for you display. These are some standard types of interior wall construction and simple suggestions on what hardware to use. Typical dyrwall is 5/8″ thick and attached to 2″ by 4″ wood studs. Standard construction techniques will find the wall studs at every 16″ on center. You can start with a modern day stud finder or use the old fashioned method of taking a penny nail and nailing it into the walls until you find the stud and measure from there. A simpler technique, if you don’t want to put holes in your walls, is to start by locating the electrical outlet on the wall as they are usually attached to a stud. You can work your way out from there to determine where you want to hang your board. I always recommend attaching to the wood stud via wood screws or lag bolts and those come in different sizes depending on the job and weight load at hand. 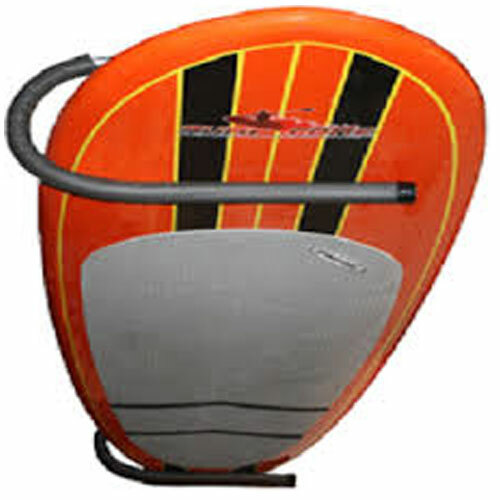 You have to include the weight of the surf rack or snowboard rack when figuring out your weight loads. 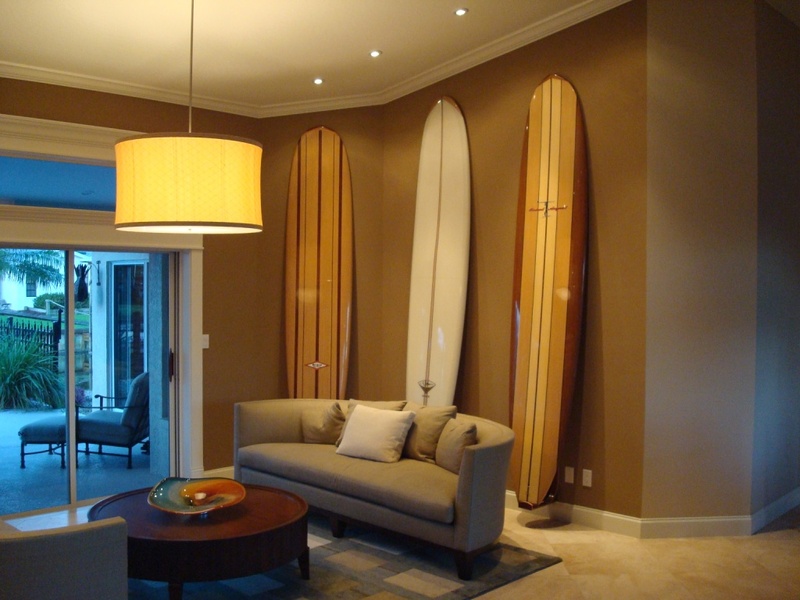 If you decide that the display location of your surfboard is not near any studs and you want to use some of the drywall anchors on the market, then you have to find the right anchor for the right job. You have to be very careful with the drywall anchors that are available. They’re weight limit capacities are only 1/4 of the weight that’s published on the box and drywall can become brittle over time and will breakdowns if it gets wet. It is a good idea to investigate the age of your home to determine the walls integrity. There are several brands of drywall anchors; Toggler snaptoggle bolts are very strong and come in different sizes and claim some amazing weigh limits. But you have to remember it’s not just about the bolt because if the drywall has been compromised in anyway then the drywall itself will be the failing part. There are plastic ones and metal ones from other companies as well. Older construction format that stopped in the late 1950’s. Builders used thinner studs that had wooden slats and sometime “chicken wire” attached to the studs so that a mortar could be spread across the form to give you a solid looking textured wall …(for more detail click here). These are the hardest walls to attach anything to because the mortar is probably so old you can put your finger thru it and the slats or metal mesh aren’t strong enough to hold any real weight. If you can find the stud then you are fairly safe with smaller snowboards and skateboards. The studs are typically thinner and are placed with different spacing depending on the lathe or metal mesh used. You can use wing nuts, but I personally don’t trust this type of wall because of it’s age. It’s strong enough to hold the wall up but I wouldn’t put my favorite Classic long board on it with out making sure it can hold the weigh. Brick or Cinder block Construction…. What kind of interior wall do you have. (i.e. is it drywall on wood studs (most modern-day homes), Lathe and plaster construction (Pre 1950’s homes), drywall with metal studs (most modern offices), brick or cinder block (usually in the garage and some beach style homes) this is important for two reasons. 1. because you need to know what type of hardware and tools you may need and 2. because you will want to know whether you can install it yourself or require some expert advice. Now decide where you want to hang it. (in the house, over the sofa, in a stairwell or in the foyer or in the garage). Location will determine whether you want something functional or something more stylish. These 3 simple tasks will then help you to determine which products on the open market are better suited to fulfill your needs. 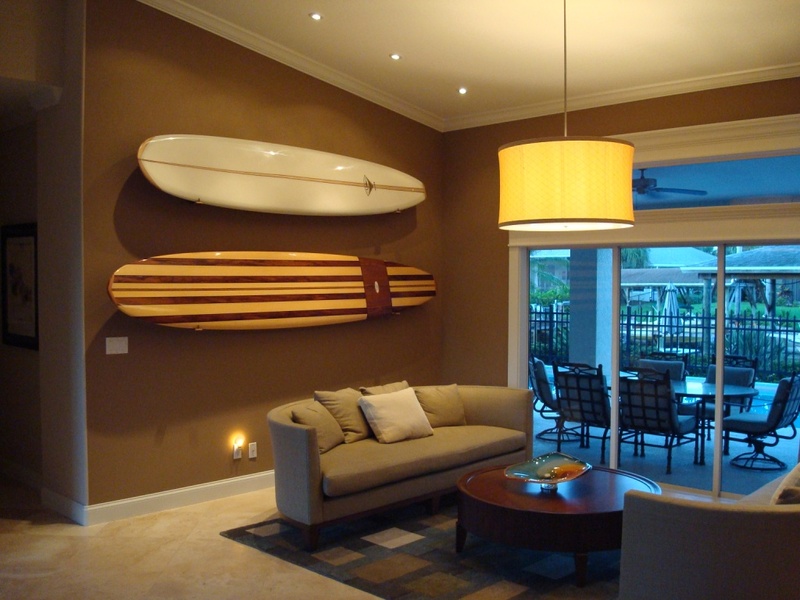 If you want to hang your surfboard indoors you may want a more decorative surf rack that won’t take up a lot of space and will add to your home decor. Look at www.hawaiiangunrack.com as they have very nice racks that come in different styles. 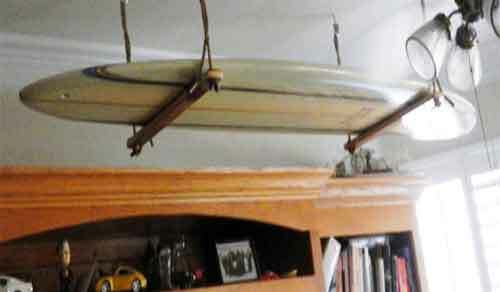 They also offer some amazing eco-friendly stand up paddle board racks made out of natural and caramelized Bamboo. 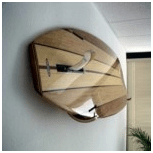 These surfboard racks are extremely well made and give your board the appearance that it is floating on the wall.